I anxiously awaited Leopard in the hope that Intenet Sharing would support WPA. I have a really hard time understanding why Leopard supports Internet Sharing through WEP. Aircrack-ng and other tools can crack WEP in uder a minute - it just does not make sense. My recommendation? If you truly need to do Internet Sharing do it through the Ethernet port (using a crossover cable) or enable WEP only for a short while and change the password every time you use it. 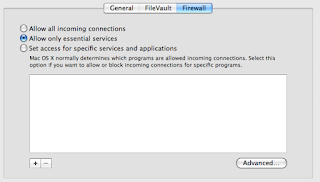 I'm glad to report that this morning after updating to Mac OS 10.5.1 the firewall seems to be working as advertised. They dropped the "Block all incoming" moniker and replaced it with "Allow only essential services", which I selected. Also, I enabled "Stealth Mode" under Advanced. I then ran some tests from another host to verify that the firewall was up and it seemed to be performing as advertised. I'm pretty interested to see what the "Essential" services are - perhaps I will do some digging soon. I disabled my firewall temporarily to scan for some open ports and then tested connections to those ports using telnet after re-enabling the firewall. All results were also positive. I'm very pleased that this issue has been resolved. I have been using Mac OS X Leopard for the last few weeks and the article on Heise Security caught my attention. I use a 3G connection to the internet quite often and have to assume that a NAT firewall wont always be available. I did some of my own tests and as far as I could tell setting the firewall to "Block All Incoming Connections" just does not seem to work. - Download WaterRoof ipfw at: http://www.hanynet.com/waterroof/ (its OSS). - Run through the Wizard, just clicking next is the equivalent of "Block All"
- If you want "Stealth", go to "Static Rules" and add a rule to block all ICMP from "Any" to "Me". - Make these changes permanent through: Tools -> Startup Script -> Install Startup Script. To test if your setup is any good head over to Shields Up! Steve Gibson's excellent resource and run some tests to check that your firewall is actually working as planned. Shields Up! can be found at: http://www.grc.com/. Please note that this test is most effective if you are directly connected to the internet. If you cannot connect directly rather Google for nmap and run some tests on your LAN. I used nmap to run some tests against the firewall to confirm the results - consider just trying to ping your machine from another host at least. For reference here are my rules, running "sudo ipfw list" from the terminal should give you similar results.